EY's country managing partner on how Russia took 1st place among the G20 countries for coordinated business support and why it's easier to file taxes here than in the U.S. There is a growing recognition among the G20 countries of the invaluable role played by entrepreneurs in economic development, and indeed, many countries have introduced a range of programs designed to help boost entrepreneurship. Here at Ernst & Young, we took the occasion of the G20 summit in St. Petersburg to examine how these efforts are progressing. We looked at all 20 countries in five different categories: access to funding; culture of entrepreneurship; tax and regulation; education and training; and coordinated support. I’d like to take a moment to share some of our findings about the country that played host to the G20: Russia. Compared with past years, we see the Russian entrepreneurial community showing more energy. It is creating new associations, and we see stronger activity in regional organizations. In short, things are improving. This progress is illustrated by indicators such as time to start a business, and the number of hours spent on administrative and tax issues. We have also seen improvements in corporate governance and immigration law. Russia performs particularly well in the category we call “coordinated support,” ranking above any other G20 country in this area. It is important to note that this doesn’t mean Russia offers the highest-quality entrepreneurial support in the G20. It means that entrepreneurs in Russia were the most likely to report an improvement in support over the past three years. Russia has three major development institutions that are actively involved in investing state funds in entrepreneurship development: Russian Venture Company (RVC), Rusnano and Skolkovo Foundation. RVC makes investments through private venture-capital funds formed jointly with private investors. The number of these funds now stands at 12 (including two in a foreign jurisdiction), worth a total of $850 million. RVC’s share is over $500 million. At the beginning of 2013, 139 innovation companies had been financed by RVC venture capital funds. Rusnano was created in 2007 and has invested over $4 billion in more than 90 companies. The benchmark is $10 billion in sales proceeds for these project companies using advanced technologies. The state-funded Skolkovo Foundation, formed three years ago to support the best innovation projects, has already provided tax preferences and grants to hundreds of new ventures. Since 2010 the Skolkovo Foundation has received about $1 billion in state funds. Of the 832 Skolkovo residents, 184 have received foundation grants worth a total of $300 million. Industrial parks are among the most effective business development initiatives in Russia. At the end of 2012 there were 303 such parks in total, nationwide. This figure is set to expand considerably, with 50 new projects announced in 2012 alone. About one in four entrepreneurs says access to business incubators has greatly improved over the past three years. Seed funding has been less available, but the Government has just announced its support for a $200 million fund to invest in Internet start-ups (FRII). This fund will pay a lot of attention to businesses at the very earliest stages of development. Its purpose is not only to provide them with money, but also to build all the necessary infrastructure for the successful development of the Internet industry in Russia. Another area where Russia demonstrates significant progress is tax administration. One example is the time it takes for businesses to deal with taxes: Russia’s three-year average is 262 hours, but as of 2012 this had fallen to 177 hours. For over 10 years Russia has had a 13 percent flat tax on income – among the world’s lowest. 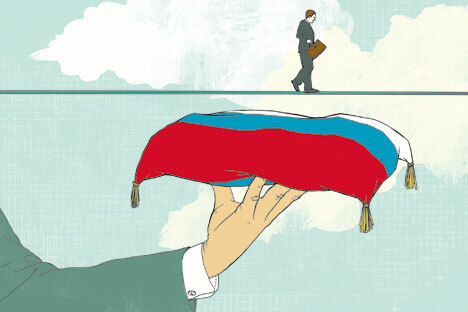 Currently, small-and-medium-size enterprises (SMEs) account for roughly 20% of new jobs in Russia. The President clearly expressed his expectation that the Government develop policies to help increase the SME share of GDP to 50 percent. To achieve this, the right steps must be taken across many areas, in order to improve the regulatory framework and the entrepreneurial environment in Russia. It is extremely important that the Government listens to what businesses have to say. Alexander Ivlev is EY’s country managing partner for Russia.